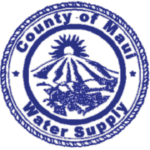 The Department of Water Supply is currently holding its 9th Annual Water Conservation Poster Contest open to Maui County students from grades K through 8 and 2nd Annual Source Water Protection Video Contest for high school students in public, private and home-schools. “Use Water Wisely” is this year’s theme. Roughly the same amount of water exists on earth today as when it first formed on the planet. Our community’s increased demand for water and periods of drought make it critical that we all do our part to conserve water. Winning entries will be featured in the Department of Water Supply’s Water Conservation Calendar for 2019. Entry forms and contest rules and guidelines are available at www.mauiwater.org. Entries must be received by March 16, 2017. For inquiries, please call 463-3110.